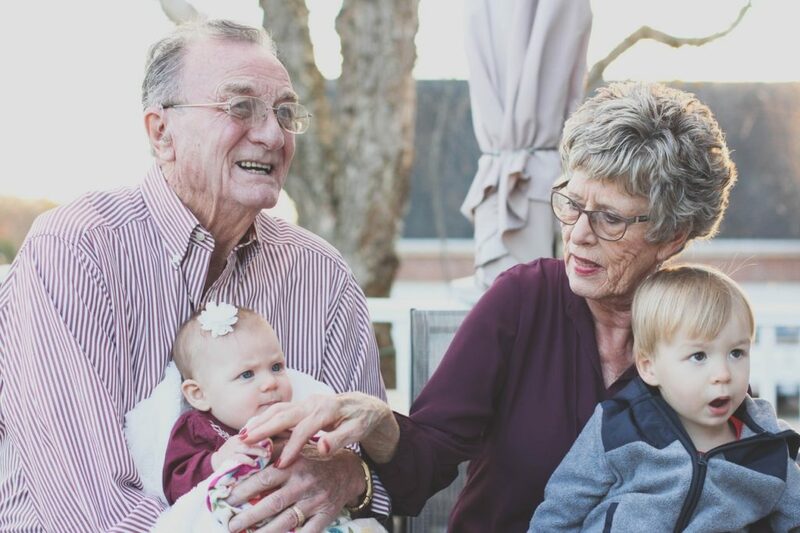 It’s a topic not many like to think about, but it’s important and necessary to draft a will in order to ensure your loved ones aren’t left dealing with lengthy and often cumbersome Probate issues. When someone passes without a living, valid will, their estate enters Probate where the laws of their state will determine how – and to whom – their personal possessions and property are divided up. While it’s not the only thing to consider when preparing your will, a summary of your assets is a large portion of what you’ll need to cover. This will also assist your family members in locating things like other bank accounts, security deposit boxes, and life insurance policies that they may not know about. When preparing your will, it’s important to know you’ll need two things: a witness and an executor. A witness is someone that will not be a beneficiary of your estate, and depending on which state you live in, you may be required to have more than one witness. They are there to sign stating your will is indeed your wishes and that you were of right mind when drafting the document. While not all states require a notarization, it’s always a good idea to get your will notarized. An executor is the person that will ensure your wishes are carried out as written. This can be a spouse, child, or trusted relative or friend. However, if your estate is complicated, you may want to consider assigning an attorney as your executor. It’s very important to include in your will that your executor has the power to pay your bills or handle any debts or related issues not outlined in your will. While most consider a safety deposit box a secure location to keep important documents, your will should not be one of them. In fact, upon your death, it may not be possible for your loved ones to retrieve your will without a court order. If you’ve assigned an attorney as executor, they will have a signed copy on-hand. In addition, storing your signed and notarized will in a fireproof safe in your home is a good idea. You should also give a signed copy to a trusted friend or family member to hold on to in case your original is destroyed for any reason. While this list covers a large majority of what you should consider when preparing your will, each state has its own laws in regards to property disbursement upon death. Follow this link to find out how last wills work in your state. For information on putting directives in place for loved ones in a long-term nursing facility, give Elmhurst Extended Care Center a call today. Today marks the first day of spring, and with it comes a season of warmer climates, bright greenery and blooming flowers, and the perfect time of year to encourage the seniors in your life to get outside and stay active. We’ve compiled a list of four different ways you can keep your senior active this spring, and these are all great to carry with them as well throughout summer and into fall! Regular exercise and activity are important for senior health, and spring is a great time to start forming a habit of taking daily walks. Even if it’s just around the block, or even simply walking back and forth a few times in front of their house each day until they feel they can do more, the act of walking itself will strengthen their muscles and their mind. And the more they do it, the more they’ll be able to walk. As with all things in life, if they aren’t used, they’re lost. 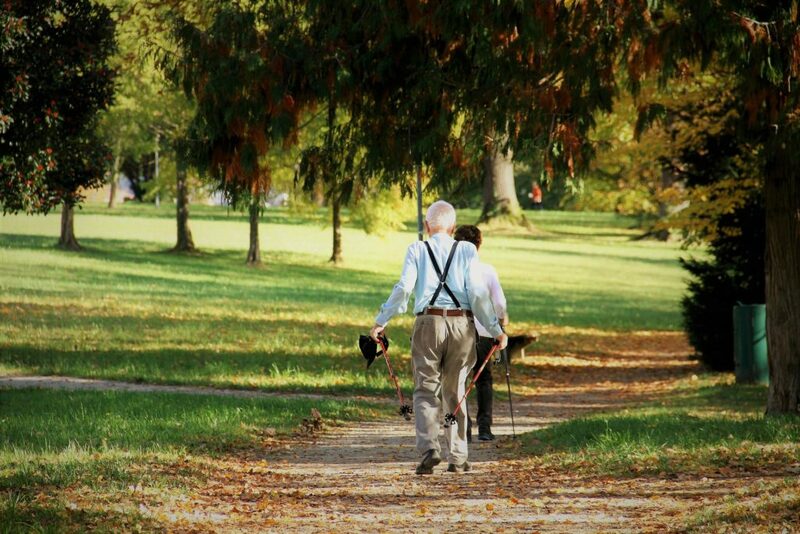 So starting a habit now of walking daily is important to keep seniors in good physical and mental health. Spring is the perfect season to soak up much needed outdoor time. After a winter of being indoors, the health benefits of getting outside can be wonderful and welcome for seniors. A great way for them to spend more time outdoors is to take their indoor games with them. Enjoying a game of checkers or backgammon at the park allows for plenty of time soaking up the positive effects of the sun’s rays, and it also allows for great exercise in the walk to and from the park. Looking to keep your seniors’ mind sharp? Have them take a deck of cards to the park to play the game Memory. The cards can easily fit into a pocket, so they don’t have to worry about carrying anything. Gardening itself can be quite meditative, but it also offers a great way to get in regular exercise. Not to mention it brings them outside where they can enjoy the sun and colors of the changing season. During the spring, seniors can plant summer flowers, fruits and vegetables in containers. By utilizing containers rather than just planting them in the ground, it offers a variety of ways they’re able to display and tend to their garden. Raised beds or planters in the yard make for better access for those that aren’t able to get up and down as easily. It’s quite common for seniors to spend far too much time in their homes, away from society and isolated. This can cause a decrease in mental health and can aid in the progression of diseases like Alzheimer’s and dementia. Find events around their community that will get them out of the house and socializing with others. Oftentimes, there are senior citizen centers that offer many opportunities for gathering and enjoying activities. You may also find options for volunteering that your senior would enjoy such as assisting with a local elementary school or heading up a town bake sale fundraiser. Look for community events that your senior will be excited about so that they’ll be more likely to find reasons to get out of the house this spring. If you or a loved one are in search of short or long term care, consider Elmhurst Extended Care Center. Family owned and operated since 1960, our dedicated and professional staff exhibit care for residents that goes beyond the status-quo. Schedule a tour today to see for yourself the difference at EECC. The holidays are a wonderful time of year for so many, but for others, it can be an uncomfortable reminder that they aren’t able to enjoy them like they used to. If your loved one has transitioned from independent or assisted living into full-time care at a nursing home, the holidays can be an extra sensitive time where worry of how they will celebrate or wondering if their loved ones will even include them in their celebrations is often the focal point of their thoughts. It’s important that our loved ones know and feel that they are still a crucial part of our lives, no matter where they reside. From personal experience in watching our residents and their families over the last several decades enjoying the holidays together, Elmhurst Extended Care Center has come up with three very important ways you can celebrate the holidays with your loved ones in nursing homes this season. While your loved one might not have an entire house to decorate for the holidays now that they’re in a nursing home, getting them into the holiday spirit is easy to do by bringing in holiday cards. Collect holiday cards from their friends and family and find a special place for them in their room at the nursing home facility. Hang them up on the wall or display them on a nightstand or dresser. Whatever you do, make sure your loved one will be able to easily see and enjoy them on a daily basis. Thinking of putting together a holiday card yourself? Try adding a family photo to yours this year! Having photos of loved ones on display is always a bright spot that makes residents feel that much more at home when they’re residing at a long-term care facility. Is there a specific meal your loved one always looked forward to each holiday season? What about special desserts or homemade recipes passed down through the generations? 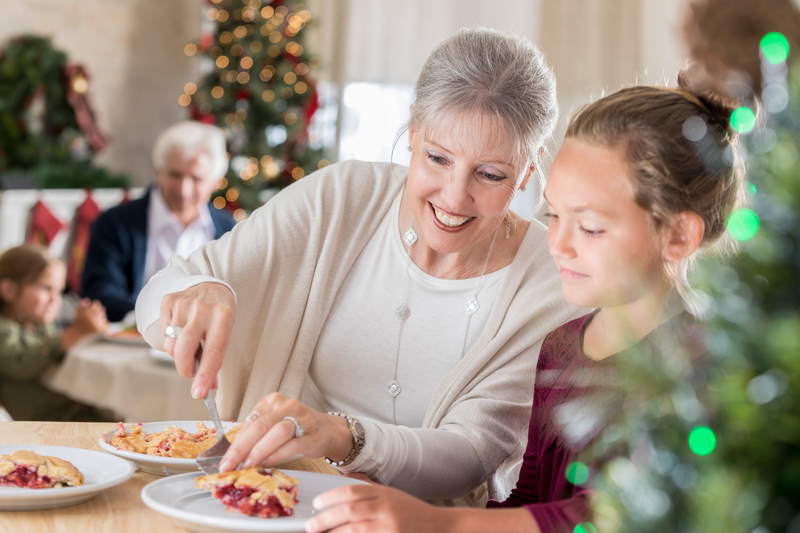 While nursing homes do provide excellent, balanced meals focused on your loved one’s dietary needs, the holidays are a time when family traditions and special meals come into focus. Nursing homes residents often feel they might not be able to partake in those traditions any longer, so bringing in their favorite dishes can really make a great impact. If your loved one isn’t big on surprises, talk with them before you plan to get together and have them help make a menu for the celebration. That way, you’ll know the food items they’re really looking forward to and can ensure they’ll be included. If your loved one was used to large family gatherings around the holidays before they moved to a nursing home, celebrating with just one or two people can leave them feeling sad and alone. Talk with the other members of your family and see if you can plan a time where you are all able to come together to celebrate and give your loved one a holiday season to remember. Check with your nursing home facility ahead of time to see if you can reserve some extra space the day of your gathering where your loved one and guests can feel right at home in your private celebration. Whatever you do, make sure to celebrate! Even if you’re unable to bring the normal large gathering together, get as many to join as you can, and make the holidays in a nursing home for your loved one extra special this year. Are you wanting to plan a gathering for your loved one this holiday season and need to reserve space? Give Elmhurst Extended Care Center a call today!